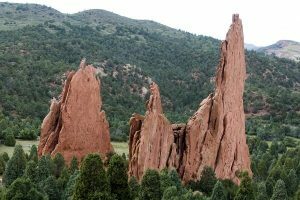 Colorado Springs Federal Criminal Defense - Oberheiden, P.C. Our Colorado Springs federal criminal defense attorneys at Oberheiden, P.C. have been defending the rights of the criminally accused and taking on the federal government for many decades combined. While our law firm has obtained wide recognition for representing health care professionals and medical industry businesses, we have defended against almost every federal law enforcement agency. Our firm also has several lawyers who had distinguished careers as prosecutors with the U.S. Attorney’s Office and the DOJ. Our law firm was developed with a focus on defending parties that have drawn the attention of federal law enforcement. We are staffed with several former lawyers with agencies like the DOJ and the U.S. Attorney’s Office. Our attorneys have over seventy years of collective experience within the Department of Justice. Because our lawyers have worked closely with federal law enforcement agencies like the Federal Bureau of Investigation (FBI), Drug Enforcement Agency (DEA), and other federal law enforcement, our approach to defending clients is proactive rather than reactive. We anticipate the tactics of federal agents, which allow us to effectively defend the rights of our clients while building the best defense. Please contact us immediately if you were contacted by the federal government or received correspondence from the U.S. Attorney’s Office in Denver (1801 California Street, Suite 1600 in Denver, Colorado 80202), the U.S. Attorney’s Office in Durango (103 Sheppard Dr. in Durango, Colorado 81303) or the U.S. Attorney’s Office in Grand Junction (205 North 4th Street, Suite 400 in Grand Junction, Colorado 81501). Our experienced federal trial lawyers serving Colorado Springs have vast experience handling all types of cases against individuals and companies in the health care industry. Our legal expertise and seasoning representing health care professionals have empowered us to diagnose weaknesses in the prosecutor’s case and improper procedures by law enforcement. We have a thorough knowledge of the statutory elements of health care offenses, affirmative defenses, safe harbor provisions, and procedural issues that can be used creatively and effectively to avoid civil or criminal liability. Enhanced law enforcement tools aimed at investigating and prosecuting fraud increases the probability that health care providers will face a civil qua tam action or criminal charges. For example, Medicare Fraud Strike Force Teams utilize the combined manpower and resources of local, state, and federal law enforcement and data analytics. These specialized law enforcement units combine investigative intelligence with data analytics. This information might lead to the OIG referring credible allegations of health care fraud to the Centers for Medicare & Medicaid Services (CMS). CMS will then suspend payments to the target. Health care providers and suppliers trust us to take on the federal government in cases involving health care fraud because less than two percent of our clients facing federal grand jury investigations, OIG subpoenas, or a target letter since 2012 were referred for prosecution. Although many clients seek us out because of our success at trial, we also have obtained overwhelming results in Medicare & Medicaid audits. Our attorneys have successfully shielded our clients facing RAC, ZPIC, and Medicaid audits from referral to the United States Attorney’s Office. Our team of more than a dozen attorneys brings exhaustive experience with federal regulatory agencies that conduct investigations and prosecutions. This background allows us to have unique insight into weaknesses in federal prosecutor cases, common federal law enforcement mistakes, subtle aspects of statutory safe harbor provisions, and other factors essential to an effective defense in health care fraud cases. Since our lawyers have investigated similar cases in the past as former prosecutors, we understand where to concentrate our attention when scrutinizing and attacking forensic tests, law enforcement procedures, search and seizures, and the questioning of our clients. This background litigating many cases involving civil or criminal liability in federal court has equipped our Colorado Springs federal defense attorneys with the capacity to dissect the prosecutor’s case to pursue the best possible outcome for our clients. Why Individuals and Corporations Under a Cloud of Suspicion Trust Oberheiden, P.C. Proven Success in Criminal Cases: While many law firms laud their success and experience in federal court, we can cite hard data demonstrating our preeminence. We have successfully represented clients in federal criminal cases across more than half of U.S. states. Our clients know we do not shy away from trial because we have represented clients in over 500 criminal trials. We have also convinced prosecutors not to move forward or to dismiss returned grand jury indictments. Thorough Knowledge of Federal Court: We have effectively represented clients in Medicaid audits, federal investigations, and against returned federal indictments. Our lawyers have defended over 1,000 clients who have received grand jury subpoenas and handled more than 1,000 federal criminal cases. Nick Oberheiden has appeared regularly on national television and radio shows because of his mastery of federal law, civil and criminal procedure, federal regulations, constitutional law, and the federal rules of evidence. Protecting Professional Licenses & Careers: Not one of our clients subject to a provider audit has been referred to the U.S. Attorney’s Office for prosecution. Each of our clients facing such an audit also kept their professional license. What charges might I face if I am alleged to have engaged in health care fraud? Stark Law: The Stark Law is a civil statute that forbids doctors from referring Medicare or Medicaid patients to an entity providing designated health services if the physician (or a family member) has a financial relationship with the entity. If a defendant is found civilly liable under this statute, the individual will be compelled to pay back any amount obtained in violation of this mandate. Penalties as high as $15,000 per service also can be imposed. Our Colorado Springs federal defense attorneys have successfully advocated for clients under this law based on several statutory exceptions. False Claims Act: While the DOJ often pursues civil actions under this law that are initiated by “whistleblowers,” this statute also can be the basis for imposing criminal liability. Even if you are facing an action for civil liability under the statute, the financial consequences can be staggering. This statute authorizes treble damages and a civil penalty of $21,563 per false claim. A key reason clients give for retaining our law firm includes the fact not one of our clients has been subject to civil or criminal liability under the FCA after retaining our law firm. Criminal Health Care Fraud Statute: Health care providers and suppliers can be criminally liable for defrauding a health care benefit program or using misrepresentations to obtain this result. Conviction under this statute carries a punishment of up to 10 years in prison and a fine of $500,000 or double the amount obtained illegally. Anti-Kickback Statute: This federal law forbids promising or providing any form of compensation for Medicare or Medicaid business. Violation of this law constitutes a felony punishable by up to a five-year period of incarceration and a $25,000 fine. Our law firm might defend against allegations under this statute by arguing the conduct at issue is protected under the statute’s “safe harbor” provisions. Should I try to clear things up by talking to federal investigators if I have not done anything wrong? No! State and federal prisons are overflowing with people that relied on this strategy. Even if you think you have not committed a criminal offense, you might have engaged in conduct or an arrangement that could expose you to civil or criminal liability. Further, misrepresentations to a federal investigator could subject you to criminal liability independent of the underlying charge. The best practice is never to speak with law enforcement officers or federal agents without an experienced and skilled Colorado Springs criminal defense attorney present to protect your rights. Whether you are the subject of a returned federal indictment or merely an ongoing investigation, our lawyers tenaciously fight for the rights of the criminally accused in pursuit of the best possible outcome for our clients. At Oberheiden, P.C., our attorneys our experienced federal criminal defense trial lawyers. Call us at (888) 519-4897 or request a free case evaluation online now to discuss your options.